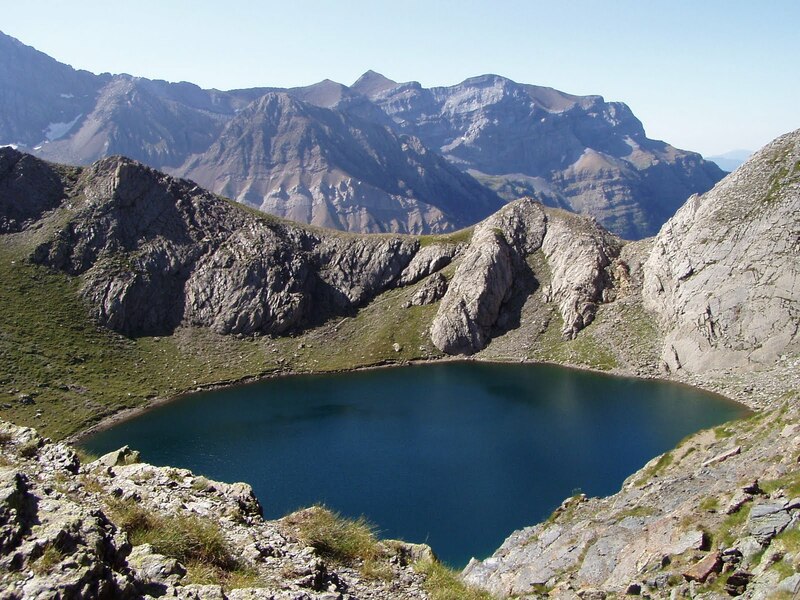 The construction of the hydroelectricity scheme in the 1950s, and the ski stations in the 1970s, have given the valleys of the Central Pyrenees roads reaching high into the mountains. These allow you to tackle passes and summits that were once accessible only with an overnight stay in a refuge as day walks from Hotel Les Templiers in the historic centre of Luz St Sauveur. 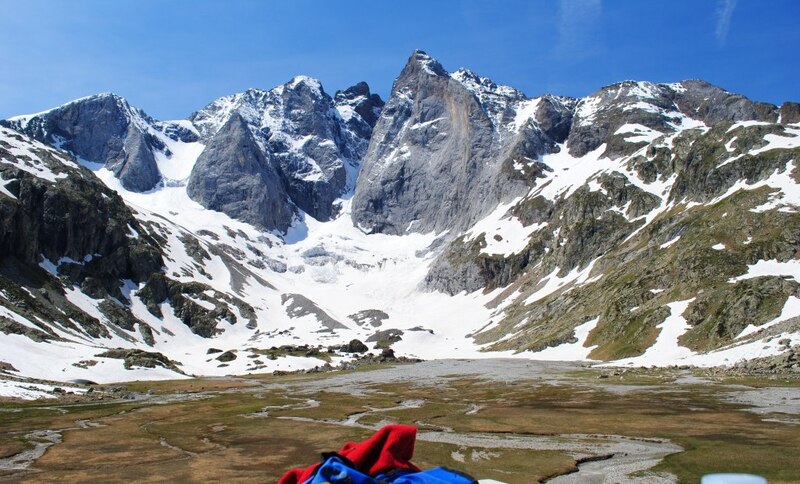 Luz is an excellent base camp from which to explore; it gives you access into the frontier summits along with the Néouvielle Nature Reserve. 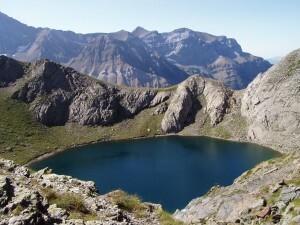 Given the strenuous and high altitude nature of these walks we have included the option of guiding for either three or six days of the week (for groups of four or more), which also allows you to tackle, should you choose, more challenging itineraries than we would suggest walking independently. 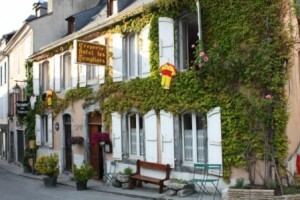 Price: 60€pp/day Bed & breakfast twin share accommodation in Hotel Les Templiers, maps, notes and advice. Note that there are a large number of dinner options in and around Luz - we are happy to book a table for you each evening and provide advice on where to eat - a different restaurant each night if you would like! Optional: picnic 7€pp, single room supplement 25€. Dates: July – October 2018. Contact: Sian. Day One: The Saugué Plateau and Portaillou Pass provide you with spectacular views firstly into the Gavarnie Cirque and finally, from the pass, onto the frontier summits including the Breche de Roland and the Taillon, which you tackle later in the week. 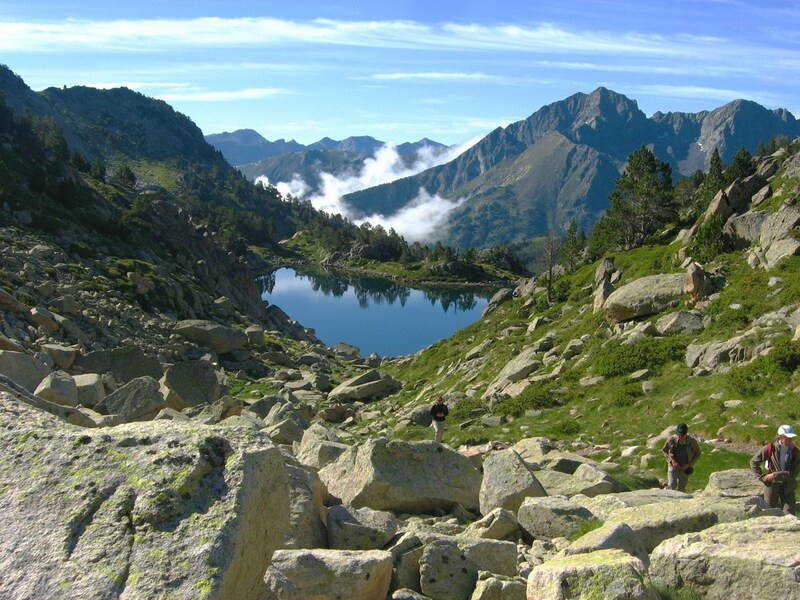 An excellent warm up walk through the pastoral scenery of the high Pyrenees. The plateau is dotted with barns, sheep, cattle, irises and blueberries. What more could you ask for on a first day?! Day Two: The Madamette Pass and Peak. At 2657m this peak is accessible but interesting, with wonderful views onto the big lakes of the Neouvielle Nature Reserve. Walking up through the pretty valley of Aigues Cluses you then turn off and head higher, up into rockier terrain. Either reach the pass and return via the same path, or the peak and return via a circular route. The scenery is very different from the first day - granite rather than limestone, less pastoral and a higher mountain atmosphere - all lakes, rhododendrons and pines. 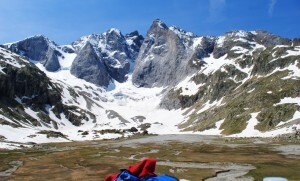 Day Three: The Brèche de Roland (2800m) with the option of the Taillon Summit (3144m) provide a challenging day out. Leaving your car at 2200m your walk begins in high mountain terrain. 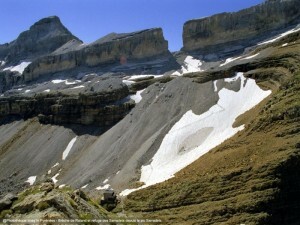 The Brèche is a huge rectangular cleft in the frontier chain above the Gavarnie Cirque. It is spectacular enough in itself, and by passing through it you have the option of climbing to the Taillon summit from Spanish side. Day Four: The Pont d'Espagne, Lac de Gaube and the Oulettes de Gaube provide you with a wonderful day out in the neighbouring Cauterets valley. 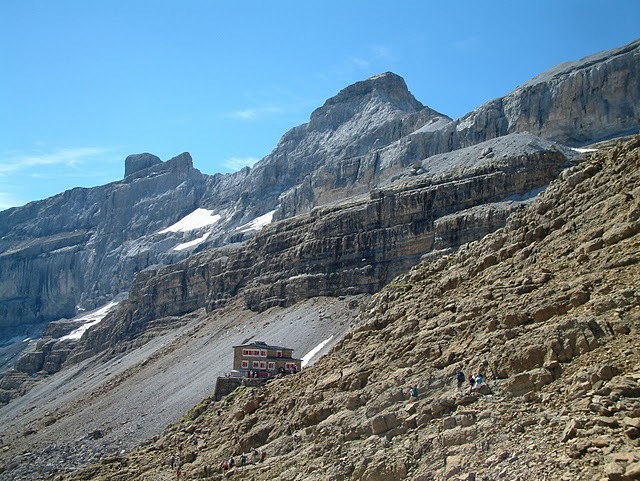 Arrive at the refuge with its views onto the north face of the Vignemale and the Oulettes glacier (the lowest in the Pyrenees). A slightly easier day for the middle of the week, but unmissable scenery. Day Five: The Gavarnie Cirque and Piméné Summit. Gavarnie is the most well known site in the Central Pyrenees, and is the home of mountaineering in the Pyrenees. This walk from Gavarnie village (1300m) takes you high above the cirque to either the Hourquette d'Alans (2430m) or the Piméné Summit (2801m). 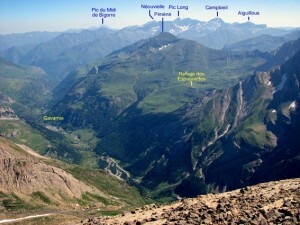 The photo shows the Piméné in a central position in the valley - fabulous views all ways. Option of sleeping in a refuge to shorten the walk. Day Six: The Bernatoire Lake and Peak. The drive into the Ossoue Valley is an adventurous start to the day in itself. From the Ossoue dam you see up to the Ossoue glacier underneath the Vignemale, and you begin your walk here. 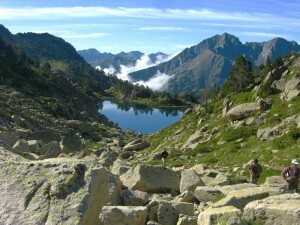 The Bernatoire Lake sits right on the border and is famous as the route by which Spanish cows cross over at the end of July each summer to graze in French pastures, an exchange that dates back to medieval times. The peak is 300m above and well worth the extra hike. Each day we discuss the weather for the coming days, and how you are feeling in order to suggest an appropriate walk for the following day. This allows you to adjust your itinerary according to the conditions at the time, how you are feeling and how you have found the previous days walks. There are two options for doing these day walks in guided form, which given the altitude and the ascent each day, is well worthwhile. a) As a “customised” trip, where your group (four or more) stay in the Hotel Les Templiers and choose your guided day walks. b) You can also choose three days guiding and which allows you to have a guide for the more challenging itineraries and to tackle others independently.